It's been seven weeks into Bullet Journaling and I'm working on my week at-a-glace layout, every week. I'm continuously trying different weekly layouts so that I can find my perfect fit. And till now I have tried six different weekly layouts! These layouts have been evolved according to my needs every time. I don't want to overwhelm you by sharing all of them at one time, so I have decided to break it into two (and more) parts. 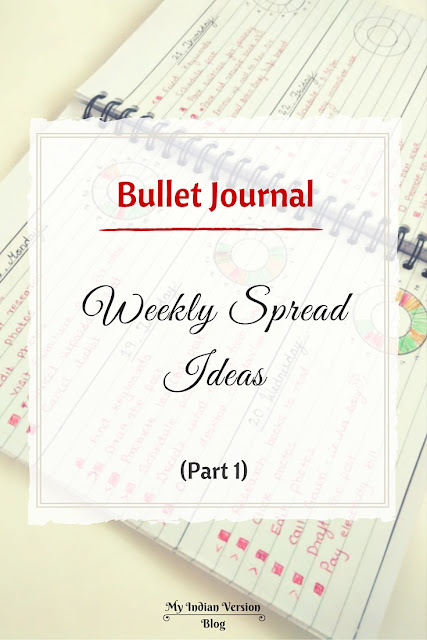 Thus, this becomes Bullet Journal Weekly Spread Ideas : Part 1. 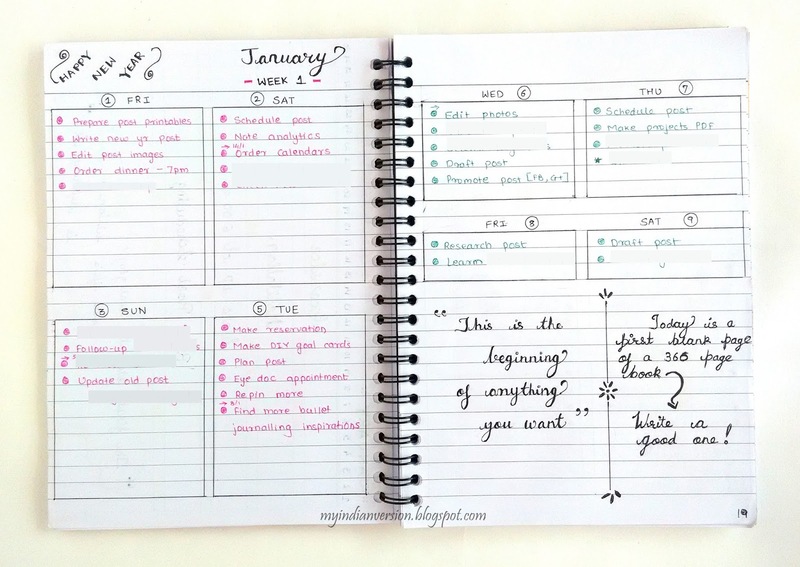 If you prefer using just weekly layouts then you will like this weekly spread evolution. As I like to see my whole week at a glance, I have to try few of the layouts to finally settle down on one. Writing tasks that need to be done in the upcoming week before hand allows you to divide them proportional throughout the week. If I ever miss planning a day before, I tend to procrastinate weekly tasks till Saturday and finally moving it to next week. So better to plan ahead of time. I somehow don't like to keep half page blank and move to the new page. So I try to arrange my weekly layout that will utilize the whole space as much as possible. What I Planned - Two-page weekly spread. Four days on a page, a notes section and a motivational quote. How I Used - I was little doubtful about this layout on how I would it go. So I did not draw the complete layout at first and just drew 4 equal boxes on the first page. Since I was out on 4th Monday, I skipped the day from the weekly spread. After four days I realized I will need fewer lines to write everyday tasks, so the next page was altered accordingly. Nothing was noted in the notes section so I filled it with another new year quote. What Needs to be Changed - Number of lines for everyday tasks and no notes section needed. What I Planned - One-page weekly layout with no notes section. Top space is kept free for writing quotes or some inspirational words. How I Used - In the third week I laid the whole week layout on Sunday and then pre-scheduled fixed tasks for that week. I also marked festivals and reminder for the intended day. As you can see I also noted a milestone on colored tape. What Needs to be Changed - As I was struggling to complete my daily to-do list I decided to add a time tracker to track my daily routine. So I added a time calculator to track how much time is spent on work, personal commitments and distraction. What I Planned - Two-page weekly spread. Three days on a page and a circular time calculator for each day. 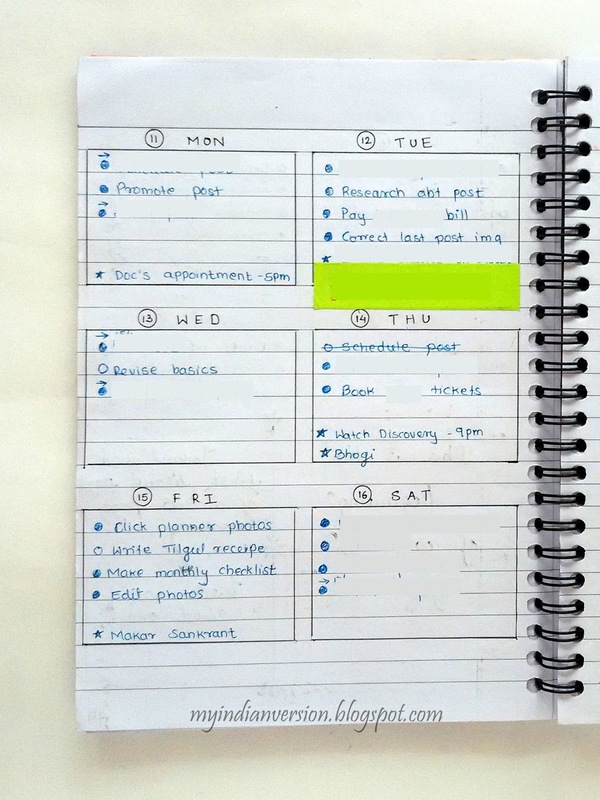 How I Used - Once again laid the complete layout and pre-scheduled tasks of that week. Time calculator tracks 16 hours of my day. I skipped dinner and sleep time because it will be somewhat same every day. I color coded time calculator as green for work, golden for personal and red for distraction. As I was busy completing some urgent work which came up without notice that week, I could only track timings for first 3 days. What Needs to be Changed - Circular time management diagram took more time to draw. So needed something simpler way for time calculation. As I was on small vacation in the fifth week of January, I have nothing to write in. 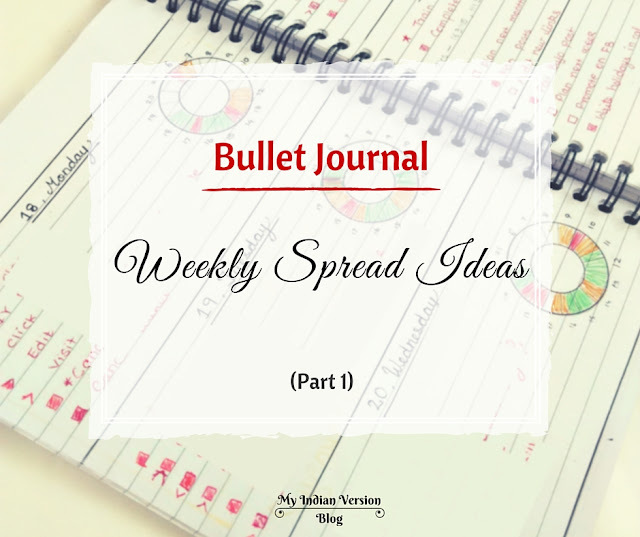 The next step of weekly spread evolution continued in February. 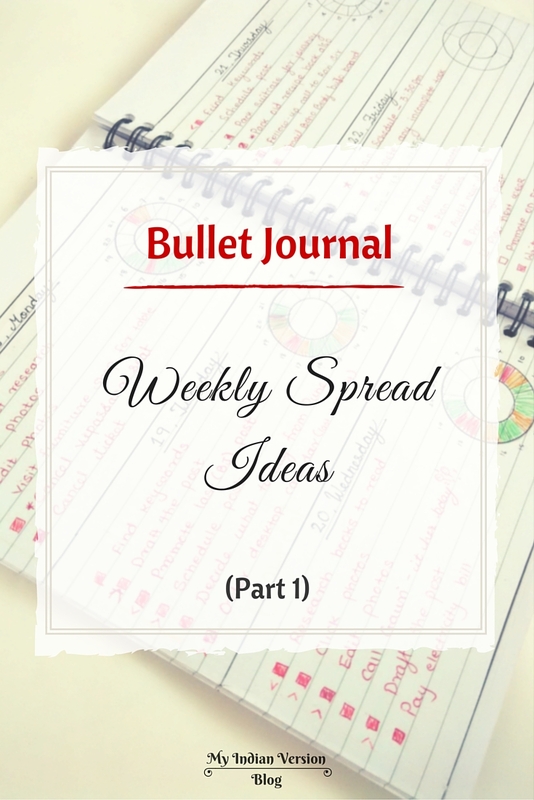 I will discuss more weekly spreads in next part. Meanwhile tell me any of your bullet journal evolution story. Me and my lovely readers would love to hear it. Come over and befriend on Facebook and Google+. You also follow me on Pinterest and Bloglovin for cool inspirations and regular updates. Thank you so much for this series of posts. 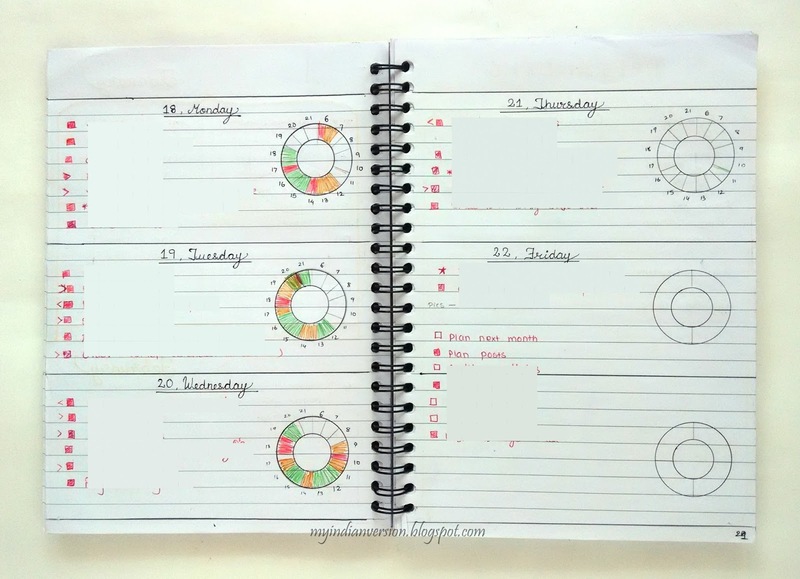 I love how you've tracked all your different weekly layout spreads and said what works/doesn't work. 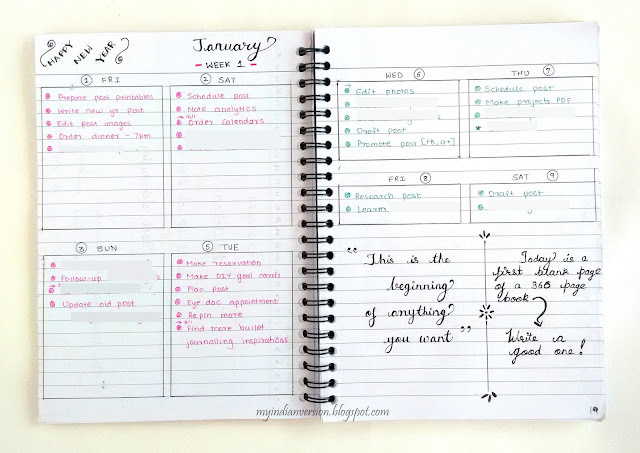 I'm just starting out on my BuJo journey and it's great to see so many ideas as well as to know that it's ok to change things up as little or often as needed. That is really what makes this form of journaling so powerful. Hey Amanda! I'm so happy that you found this series useful. It is really important to know what works in your bullet journal and what not. And changing layouts accordingly is actually a good sign as a bullet journalist! This is so helpful! I love your detailed analysis hahah! Thank you so much! Thank you for such sweet words Charis!